Receive the "100 Greatest Ancient Coins" book FOR FREE! ... with your first ancient coin purchase of $1,000 or more. If you’re thinking about collecting ancient coins then we have a deal you shouldn’t pass up. 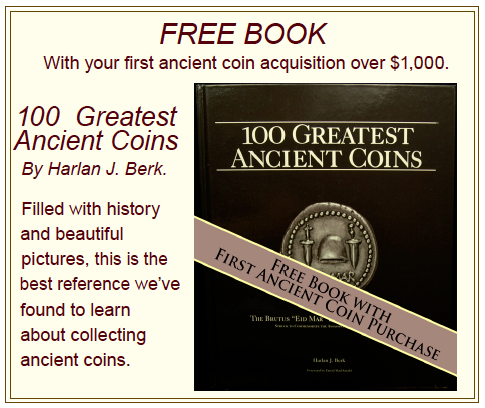 For all first-time clients investing $1,000 or more, we are going to mail you a copy of 100 Greatest Ancient Coins, by Harlan J. Berk. We think this is the most fascinating book on ancients ever produced and it’s perfect for newcomers to the ancient coin market. Inside you will learn all about this fascinating market and it’s loaded with pictures and history regarding some of the most beautiful and desirable coins known in the world today. If you want to find out more, talk to one of our Ancient coin specialists at Ancient Gold Coins, Monday through Friday 9am to 9pm, at 1-800-550-6314. Here at Ancient Gold Coins, we love to provide our customers with the best information on collectible coins. Take a look at all of the rare gold coins we offer!